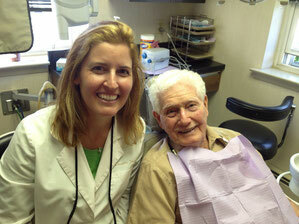 Dentist in Blue Bell, PA (610) 279-0363 - Danelle C. Fournier, D.M.D. At our family dental practice, we’re focused on you. We’ll take as much time as needed to answer your dental questions and offer tips to keep your teeth looking and feeling their best. While you’re here, you’ll always receive our undivided attention because keeping your smile healthy is our #1 priority. “There are three reasons that I see myself as a lifetime patient of your office. Most importantly, I feel very comfortable with you and your abilities as a dentist. It was very obvious to me on my first visit that you’re an expert in your craft and I trust your advice on dental care. I get very nervous at the dentist but I have never felt nervous, other than maybe my first visit at your office. Second, I enjoy the atmosphere of your office. I know almost all of your employees by first name, and I love how friendly everyone is at your office. At the risk of sounding cheesy, it’s almost like Cheers where everyone knows your name. I can tell that your staff are friends and work together well. Like I said, I usually get very nervous at the dentist but this is very helpful in alleviating that. Lastly, the ability to get convenient appointments is helpful. I appreciate the evening hours. Furthermore, I’ll never forget how you slipped me into the schedule when I had a filling fall out a day before my Mexico vacation. You were a lifesaver. I am very happy with your office. I think this is demonstrated by my wife and daughter becoming new patients after we got married." We’re only a few miles from Wentz Run Park in Blue Bell!